After plenty of teasing and heavy marketing, the newcomer OnePlus has now officially unveiled its OnePlus One handset at a special event in Beijing. Ever since the launch of the company was announced by former Oppo exec Pete Lau, OnePlus has a promised us a device that “never settles”, breaking the mold to give us something worth truly being excited about. Whether the OnePlus One actually meets this ambitious goal is probably a matter of personal preference. So what’s under the hood of the much-teased OnePlus One? At the heart of the device you’ll find all the hardware you’d expect from a flagship 2014 device including a 2.5GHz Qualcomm Snapdragon 801 CPU, Adreno 330 GPU, 3GB of RAM and either 16 or 64GB internal storage. The OnePlus One also includes a 5.5-inch 1080p display, a 13MP Sony Exmor IMX 214 rear cam, 5MP front cam, 4G LTE, a bevy of sensors, and a 3100 mAh LiPo battery. The OnePlus One adopts a minimalist design language that is very reminiscent of the Oppo Find 5, and even the Find 7 to a somewhat lesser extent. Like Oppo’s devices, the OnePlus One offers a high-end build that feels good in the hands and is noticeably lighter than what you’d expect from a typical ‘phablet-sized device’. The OnePlus One will also feature removable covers that will come in a variety of different materials including wood and denim, though these backs won’t be available right at launch. Probably one of the biggest selling points for the OnePlus One, however, is that it is the first device to be built front the ground up with CyanogenMod in mind. 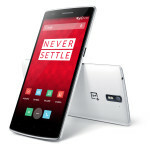 Unlike the Oppo N1 CM Edition, the OnePlus One features a custom-tailored version of Cyanogenmod that is designed to take advantage of all that the One has to offer. Dubbed CyanogenMod 11S, this Android 4.4 KitKat-based OS not only includes everything you’d except from CM, it also adds several new features and even has a theme engine and store that allows you to truly customize the look and feel of the OnePlus One. Looking at the specs above, it’s obvious that the OnePlus One isn’t a lightweight in terms of hardware prowess. A device with this kind of power under the hood could easily be priced at $550 or higher, but, remarkably, OnePlus will offer the One for just $299 for the 16GB model or $349 for the 64GB version. This puts the OnePlus into the same pricing category as the Nexus, and yet it delivers improved specs and a larger display. 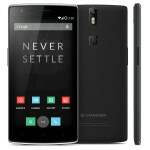 The OnePlus One will initially be available in Belgium, Finland, Austria, Denmark, Germany, France, Italy, Netherlands, Hong Kong, Spain, Sweden, Portugal, Taiwan, the UK and the United States. The OnePlus One will become available from late May. OnePlus has several contests in the works and other ‘invite only’ ways of getting your hands on the device. OnePlus is even holding a special “smash” contest”, where you can apply and offer to smash your current phone and in exchange you’ll get a OnePlus One for just a buck! April 23, 2014 – Following months of anticipation, OnePlus today revealed their flagship device, the OnePlus One. Embodying the OnePlus motto of ‘Never Settle’, the OnePlus One boasts industry leading design, superior build quality and top of the line specs at a disruptive price point. The OnePlus One was designed to be beautiful, timeless and comfortable in the hand. Embracing this design language, the One features subtle curves, sleek lines and a slightly raised, jet-black display. Even the smallest details belong uniquely to OnePlus, from the custom cut and engineered PCB boards to the specially designed battery and dyed inner casing. Each component is meticulously aligned and adorned with a OnePlus logo for a gorgeous device inside and out. Measuring only 8.9mm thick, the OnePlus One is ergonomic and easy to grip, with a tapered edge of just 4.6mm. The OnePlus One packs a 5.5” 1080p full HD JDI screen. LTPS and TOL (Touch On Lens) technology provide an incredibly sharp picture and make the gorgeous 178 degree vision display significantly more shatterproof. OnePlus is a global technology startup committed to creating beautiful devices with the best possible hardware to ultimately create a better day-to-day experience for users. Developed around the mantra, ‘Never Settle’, OnePlus aims to disrupt the industry by providing top of the line technology to users around the world. For more information, please visit http://oneplus.net. So, there you have it. Is the new OnePlus One the flagship killer that’s billed to be or was the hype too much?